Recognising the growing importance and recognition of Asian arts and culture, ZHdK launched their first Chinese contemporary arts study and exhibition as the first module of “On Global Culture” executive education programme in 2014. The case studies around the Chinese Contemporary Art Award, the Sigg Collection and Hong Kong’s M+ Museum form the basis of different research and educational activities, which included an exhibition, a series of in-depth workshops and online course were organised. China is not only a burgeoning economic superpower but also boasts astonishing artistic productivity and ambition. While the country’s central government disseminates the principle of “soft power” through Confucius institutes, Chinese artists, students, and scientists across the world, while a self-confident new generation of art collectors is driving the prices of works auctioned at Christie’s and Sotheby’s to exorbitant heights, while even museums are mushrooming in the People’s Republic, an art scene has emerged within and beyond China that meanwhile rivals the creativity, relevance, and diversity of its Western counterpart. Since the 1970s, China has brought forth various artistic streams and styles that either engage with or ignore Chinese traditions, that are either politically active or indifferent, and that have written themselves into the history and consciousness of three generations. 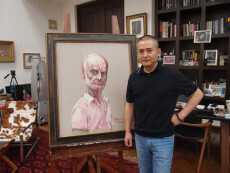 Along with renowned artists like Ai Weiwei, Wang Keping, and Cao Fei, the Swiss patron of the arts and collector Uli Sigg is one of the most important actors within the short history of contemporary Chinese art. Today, Sigg is considered the most important collector in the field and one of its most important experts. The precondition for Sigg’s collection was the establishment of the Chinese Contemporary Art Award (CCAA) in 1997. On the one hand, initiating the CCAA has helped Sigg to acquire a unique knowledge of the Chinese art scene over the last 20 years. On the other, the activities of the CCAA jury, whose early members included Harald Szeemann, have created an unrivalled platform for the meanwhile global exchange of concepts and ideas between Chinese and international curators. Through systematic research and analysis, ZHdK attempts to commence academic conversation in this emerging artistic phenomena, further on to preserve important study materials for archival purposes. From this point onwards, ZHdK plans to introduce similar in-depth studies on other international success stories about trendsetters of the contemporary art world.